Really? I thought that was entirely what it was for. Under what circumstances would it work, then? At any rate, with vsync in-game off and vsync (w/triple buffering) in Inspector, I'm getting no tearing and framerates generally in the 50s with dips into 40s, just walking around the opening scene on campus, using the aforementioned graphics settings. Vsync off is not an option as then I get tearing. Inspector is nothing more than an interface to the driver's settings, and driver's triple buffering option works only in OpenGL programs. Forcing driver's vsync (via Inspector) instead of using the app's vsync do lead to performance differences sometime however. Ah, I see. But if I'm not getting triple buffering through Inspector, then why are my framerates not locked to 30/60fps? Are you playing in borderless window? Vsync used to be on by default with that, for me. W testach wykorzystali&#347;my najnowsze wersje sterowników - dla kart Radeon by&#322;y to sterowniki Crimson w wersji 16.11.4, a dla kart GeForce sterowniki Game Ready 375.95. What's funny is the argument we've had about a year ago on how this bad DX12 performance is somehow rooted into NV's h/w deficiency - while in fact it was all just bad s/w optimization. Steam version seems to work pretty well for me on a 980ti. I'm satisfied. Damn, the graphics in this game are pretty spectacular. I can't say that I am a big fan of the gameplay after having completed the first mission (seems very similar to Max Payne), but the graphics are top of the line as far as linear action games go. edit: WTF. The CPU is the problem here. I overclocked my 7700k fropm 4.8GHz to 5GHz and FPS increased by 10. Is this because of DX11? Is the DX12 version better? 5GHz is kind of insane. Stylistically, things can get pretty nuts later on. Action encounters stay fun, and have constant prompts for using mixes of the abilities, once the logic of it clicks. DX12 version is certainly much worse on NV GPUs. A 6C/8C CPU would fare a lot better though. Not gonna buy a new CPU&Mobo just for this and with all respect to developers: When QB came out 6c/8c CPU were only available on lintels high end x99 platform. I'm probably going to refund it. Got my graphics card upgrade (780ti -> 1070) today. I had a 1080 when I played through the game late last year and opted for no upscaling + Ultra. It definitely didn't run at 60fps 100% of the time, but even at its worst, it was perfectly playable. If you're looking at buying the game on Steam, keep in mind that time played in Offline Mode currently doesn't count against the two-hour window. That, in essence, affords you an unlimited amount of time for tinkering. I had a 1080 when I played through the game late last year and opted for no upscaling + Ultra. It definitely didn't run at 60fps 100% of the time, but even at its worse, it was perfectly playable. If you're looking at buying the game on Steam, keep in mind that time played in Offline Mode currently doesn't count against the two-hour window. That affords you essentially an unlimited amount of time for tinkering. Wow that's crazy, how did I never think of doing that. That performance doesn't sound great to be honest. I remember reading that the Windows store version ran quite badly compared to the Steam version. Any truth behind that? 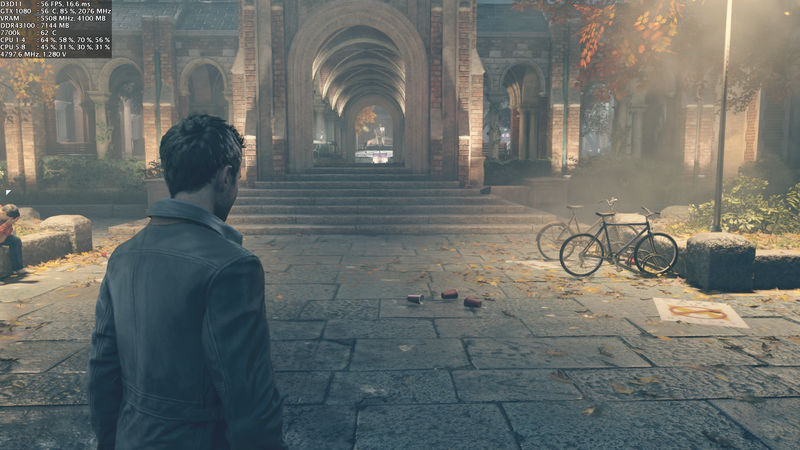 The game is demanding, but for good reason: Remedy's engine is one of the very few with a real-time global illumination system that is complimented with volumetric lighting and dynamic shadows. If you remember being impressed with Alan Wake, think that technology cranked up to 11. The game actually scales quite well when you consider that the X1 version runs at 720p with medium settings. The Steam (DX11) version does run better, but it's something of a YMMV thing as the gains on the Nvidia side are larger. Can you get XBL achievements on the Steam version? Tbh I'm surprised that CPU OC makes that much difference in your case as I was running the game at 100% GPU utilization all the time basically and it would made absolutely no difference in my case. But then I did have 6580K already when I played it. 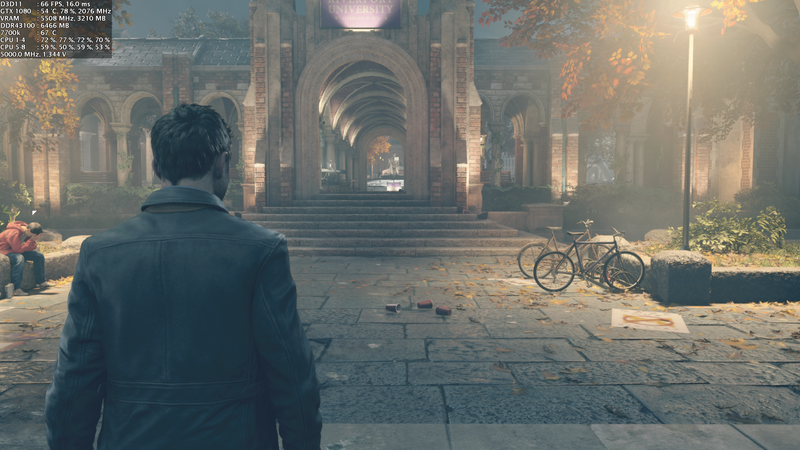 How well does Quantum Break on Steam run on an i7-6700k and an R9 Nano at its current form? Recently got the Timeless Collector's Edition for the same price as the Steam sale price, but I'm still wondering if the DX11 version gimps AMD cards still despite newer drivers. Anyone able to use DSR with this game? I can't select any resolutions above my native in the menu.